Mantas or devil rays are amongst the most fascinating inhabitants of the world’s oceans. So it is surprising that they are also amongst the least known of all the fishes that inhabit the seas. Some species attain a gigantic size, and were once the subject of superstitious fear simply because of their devilish appearance. Only recently mantas have gained the favour of diving tourists, who enjoy their gentle attitude and the sight of their majestic swimming and demeanour. And yet, knowledge of their family tree was messed up into an almost inextricable confusion, and nobody was sure of how many species existed, because, through research spanning over two centuries, ichthyologists the world over had described devil rays with hundreds of different names. Part of my doctoral work at the Scripps Institution of Oceanography included tidying up this mess. For years I traveled around the world looking up old specimens in the most diverse museum collections, from Harvard to Chennai, from Paris to Cape Town, and from London to San Francisco. In the end, the mountain of names which had been given to species was boiled down to a handful, because too often the same species had been described over and over again, by different people and with different names, without worrying too much whether that species had been described already by someone else. As it turned out, this painstaking work eventually carried conservation significance because devil rays have become seriously threatened despite they low market value. This is in large part by virtue of the most stupid of reasons: the purported medical properties of the devil rays’ branchial filter plates, which quite recently became fashionable in the Chinese “traditional” medicine. To limit the damage, devil ray species in October 2016 were listed by CITES, the Convention on International Trade in Endangered Species, and exporting their gill plates to China is no longer an easy business. The practical advantage of a being able to count on a detailed taxonomic knowledge of the various species, in this effort, is obvious. Studying the ecology of devil rays living in the Gulf of California, also known as the Sea of Cortez, was the other part of my thesis work at the Scripps Institution of Oceanography in La Jolla, California. 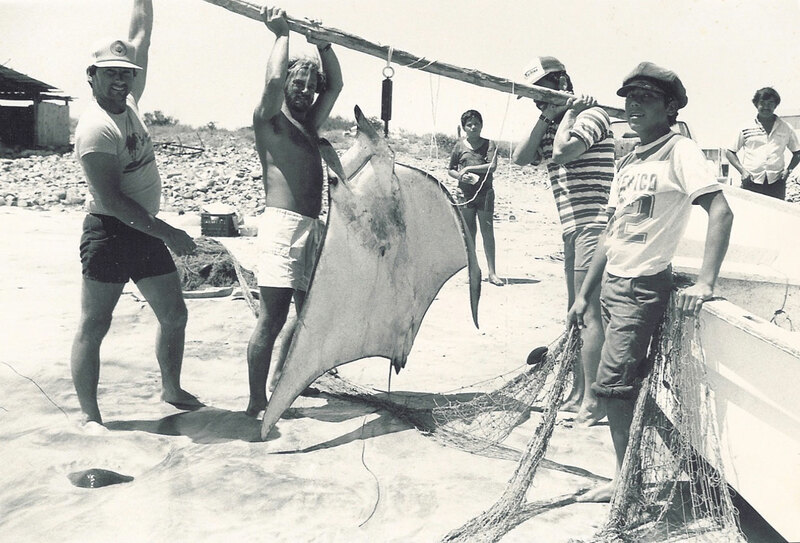 Between 1981 and 1983 I spent most of my time in an area south of La Paz, in Mexico’s Baja California Sur, monitoring the catches at local fishing camps, which often included devil rays. At the beginning of my research, having read the scant scientific literature available on the subject, I was expecting only one species, Mobula lucasana, to be occurring in the catch. The fishermen, by contrast, insisted that there were four. They were of course right. In addition to M. lucasana (which tuned out to have been described much earlier in India with the name of M. thurstoni – which therefore has priority), I found that catches also included M. japanica (now known under the name of M. mobular) and M. tarapacana. Weighing a Mobula mobular captured by the fishermen in Punta Arena de la Ventana, Mexico, March 1983. The fourth devil ray species mentioned by the fishermen turned out to be a surprise, and appeared in the catch towards the end of my permanence in the field. I could easily have missed it. This species was much smaller than the other three, and also markedly more social, often appearing in very large groups. No matter how hard I tried to compare it with other species from other oceans, this was different, so it was a new species. Terrifically excited, I made a description of it which in 1987 I published in the Zoological Journal of the Linnean Society of London. I gave this new species the name of Mobula munkiana to honour Walter Munk, oceanographer extraordinary, and dear friend. Walter Munk (right) with H.J. 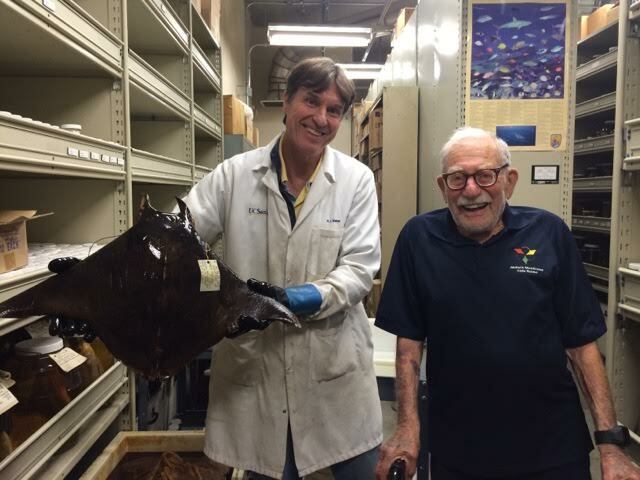 Walker, manager of the Scripps Fish Collection, admiring the holotype of Mobula munkiana. In later observations it turned out that Munk’s pigmy devil ray, which is only found in the Pacific Ocean off tropical Latin America, is perhaps the most conspicuous of all devil rays, because it occurs at times in schools of tens of thousands of animals, and has the habit of jumping out of the water, ofter a dozen at a time, in the most spectacular acrobatics. 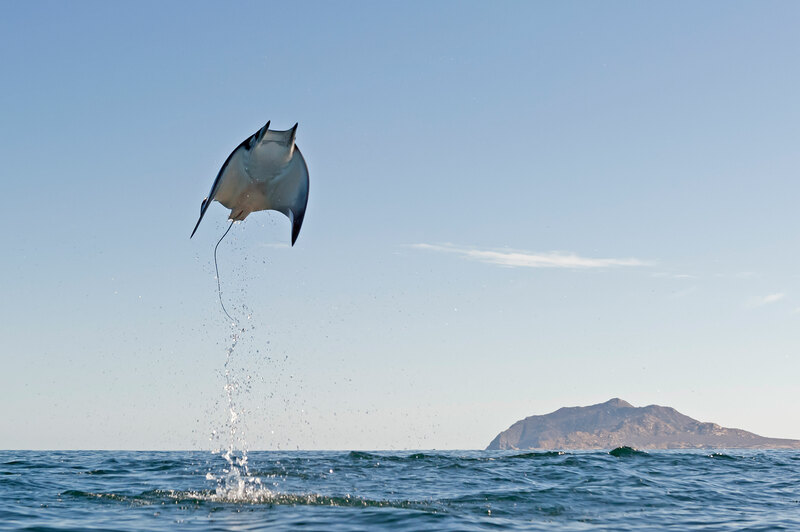 Munk’s devil ray, Mobula munkiana, taking off from the Sea of Cortez (photo by Octavio Aburto).